Capt. Dave put us on species after species and the fish were HUGE! We caught them on the fly, and bait too! He truly knows his stuff -- no matter how you like to fish! I'll be back next year! I had never done this before. You went out of your way to put us on so many different kinds of fish, The time you spent with my 15 year old son and teaching him how to throw the casting net, and letting him participate in everything he showed interest in, made this the time of our lives...not just the adults, but for the kids too! Thanks for the amazing memories, I think about that trip all the time. Capt. Dave showed my girlfriend Melisa and I how to fish for snappers and groupers on the reef, he makes it look so easy, and the offshore trip, well, we caught some really big ones, i can't wait till next year to see Dave and that beautiful water in the KEYS. 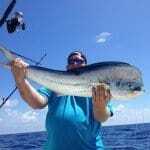 My offshore angling experience out of Marathon was with Capt.Dave and as opposed to other charters, Capt. Dave explained with out yelling how to catch fish and enjoy yourself at the same time.The king mackerel experience was awsome, as well as the cleanliness and great condition of all of his equipment.Overall I would rate my offshore fishing experience aboard the the Sweet E'Nuf to be the best yet!!!! Imagine going fishing with your best friend, who happens to be a chef as well as a GREAT fisherman. He takes you out for one of the best days of your life. You come back with the hold full of fish, and find yourself the envy of the dock. You just happen to catch a Black Fin Tuna or two that day. Captain Dave cuts it up and you have FRESH sashimi, boatside while he cleans the rest of the fish. The sun is setting, you sit back drinking a cold beer, just breathing in the keys. Then it hits you - you just met Captain Dave this morning, but it seems you've known him all of your life. Such was my first of many fishing adventures with Captain Dave. When in Marathon, my first choice will always be Captain David Schugar. Capt. Dave will go to any length to make your trip memorable. Kids on board, NO PROBLEM. The Captain has patience to teach and assist fisherman of all ages. His state of the art boat can get you on the fish in record time. The Sweet E'Nuf has all of the gear and electronics. Give Capt. Dave a chance, he's a true Florida Keys Pro. The memories will last a lifetime. It’s Captain Dave that makes Sweet E’Nuf Charters such a great fishing experience. His attention to detail, knowledge of the water, and most important, ability to catch fish is unsurpassed. Dave has a unique talent to make every trip fun and memorable by sharing his experience and devotion to catching fish. Thanks Dave for the 52 pound Dolphin, it was the fish of a lifetime and I’ll never forget it. Dave, I just wanted to drop you a line and tell how much fun we had fishing with you. I've been on charters from Hawaii to Florida and you were the most knowledgeable and the friendliest captain that I have ever come across. I look forward to getting out there again with you! I plan on emailing a couple of pics that I took of the Goliath my father caught (barely) as soon as I get a new card reader for my camera. Once again, thanks and good luck! There is fishing and there is Fanatic Fishing. 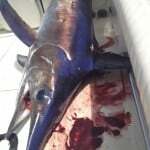 That s what you find when you charter Sweet E'Nuf Charters and Captain David Schugar. Weather you're hunting Hugh trophy fish, gourmet filets, or even fish that can eat you, Captain David will put you on it. His knowledge of angling is unsurpassed and equipment is topnotch. Away from school and relaxing in the Keys. We thought Spring Break couldn't get any sweeter, but Capt. Dave proved that is wasn't Sweet E'Nuf yet! A full day of catching HUGE fish was all we needed and we got it. Capt. Dave is a joy to be around, his boat and equipment are phenomenal and he can put you on some big fish!! Thanks for making our trip to the Key's that much better.